The Ion Age Blog: Hab Dome Top Mounts III released! Hab Dome Top Mounts III released! We have five more top mounts for our IAF015 Hab Dome core of our expansion 15mm scale terrain system. These top mounts fit the universal ring mount that features on our Hab Dome but also on our Tower Module, Block House, Command Dome and with the lower ring left off will also fit our Landing Pad too. This is the third set of top mounts we have released bringing the total choice of mounts to ten including sentry guns, comms spire, hurwent shield generator, anti-air turret, missile pods and different weapon systems too in the terrain system. An over and under rapid fire projectile anti-infantry weapon made of high quality resin and white metal. Supplied in three pieces including a separate turret ring for fitting to the Landing Platform or larger mounts or without for use on our other buildings. You can choose to buy three and save 10%. The Price is 2.50GBP. A heavy calibre projectile anti-vehicle weapon made of high quality resin and white metal. Supplied in three pieces including a separate turret ring for fitting to the Landing Platform or larger mounts or without for use on our other buildings. You can choose to buy three and save 10%. The Price is 2.50GBP. 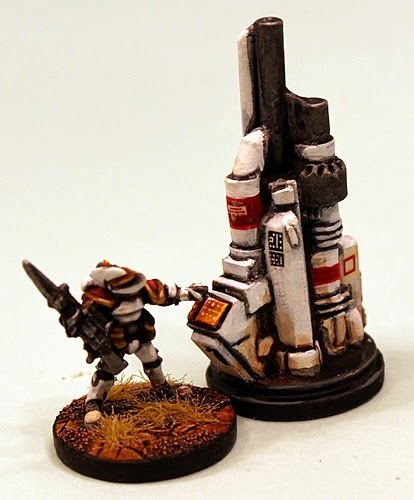 A heavy calibre projectile weapon capable of indirect fire made of high quality resin and white metal. Supplied in three pieces including a separate turret ring for fitting to the Landing Platform or larger mounts or without for use on our other buildings. You can choose to buy three and save 10%. The Price is 2.50GBP. An energy weapon for anti-vehicle use made of high quality resin and white metal. Supplied in three pieces including a separate turret ring for fitting to the Landing Platform or larger mounts or without for use on our other buildings. You can choose to buy three and save 10%. The Price is 2.50GBP. A powerful magnetic weapon made of high quality resin and white metal. Supplied in three pieces including a separate turret ring for fitting to the Landing Platform or larger mounts or without for use on our other buildings. You can choose to buy three and save 10%. The Price is 2.50GBP. Go HERE to see all of the Top Mount III turrets on our website. Select your option from the drop down menu on the page. We have a 15mm scale landing pad set which fits onto the top of our Hab Dome, Tower Module and Block House but can also be used flat on the wargame table by leaving off the bottom mount plate. This is a superb resin model. There are three choices for purchase and those are IAF015E Landing Pad kit only, IAF015E1 Landing Pad kit with Flak Cannon and IAF015E2 Landing Pad with Missile Pod. You can also choose on these options to 'buy three save 10%' as normal. Prices range from 7.00GBP to 9.00GBP depending on your choice. Go HERE. During battle or just in times of need portable Fabricator Spires are left or dropped into place by military and or civilian authorities. Their task is simple and at the same time magical to some more primitive peoples...they make something from nothing. Those in the know realise that is not really something for nothing, the fabricator gathers energy in its spire and uses that power to convert contained solid blocks of matter into objects. 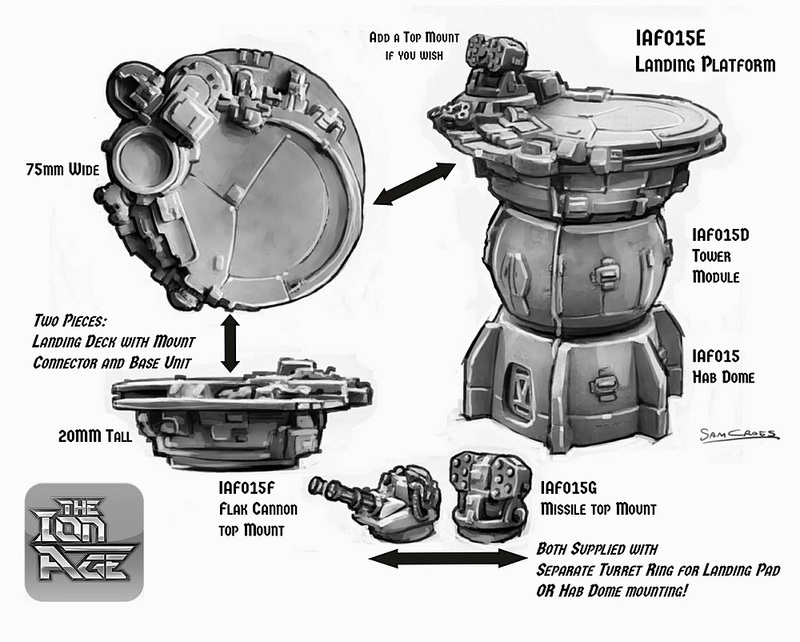 In battle fabricators make ammunition for common weapon types upon request from alloys they hold. The Fabricator Spire stands 42mm tall and has a request console on its front for data input. IAF024 Fabricator Spire. It is a one piece high quality grey tone resin casting. As always this code can be bought as a pack or as a single or select the three packs and save 10% option on the page. Go HERE. Price 2.50GBP each. Its the first month of 2015 and this is our first information burst of the year too. This year will see a lot of expansion to The Ion Age with new forces, new vehicles and perhaps even our first non human miniatures as well. But before all of this we deal with the here and now, the cut and thrust, the darkest and longest month of the calendar which is perfect for wargaming indoors and in the warm. 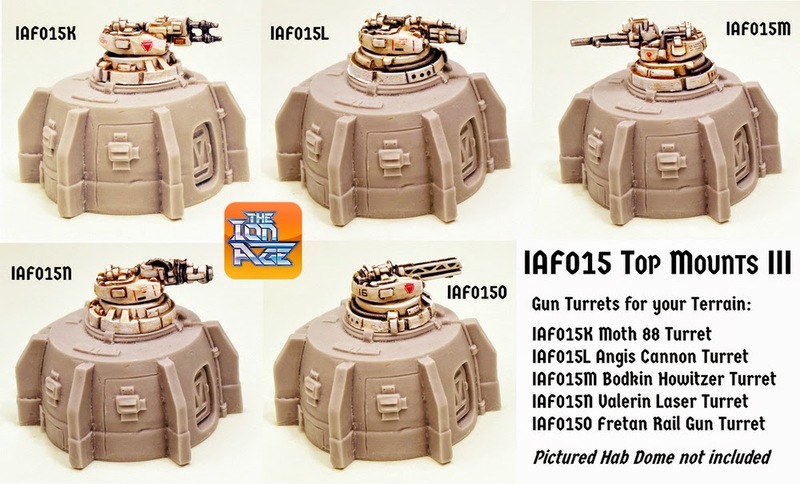 We made a lot of new 15mm terrain last year including the whole Hab Complex and the Geo Shelters too and now we are adding five more turrets which will make many IonFans happy. We will have one more release a week from now this month as we have big things coming in February. So if you are planning a purchase and want the current free IMP17 Far Trader miniature and or you want to use your stored up Reward Points on your customer account from last years purchases we suggest you wait one week to see our new vehicles next week at this time. Finally remember that by placing an order with us you will sign up for an account with the website and that means you get Reward Points in all purchases. These points can be used any time to get free products and discounts on orders.